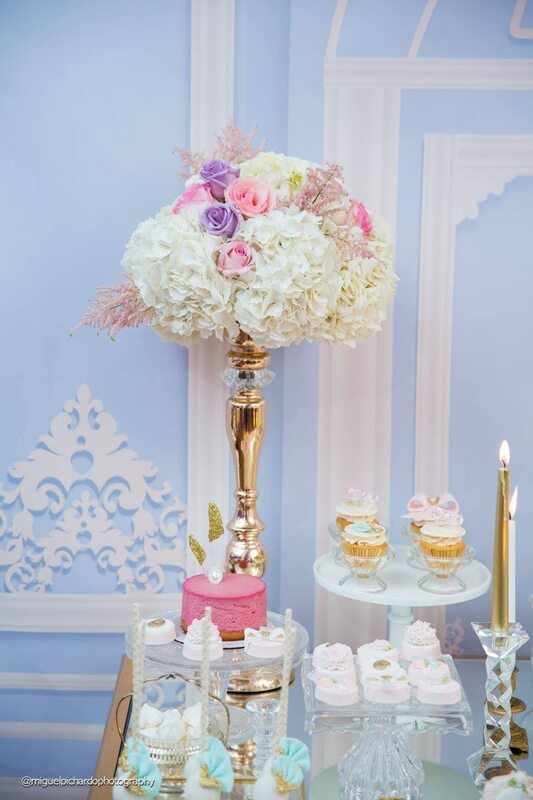 This Gorgeous Marie Antoinette Baby Shower features gorgeous royal-inspired decor, lush florals and amazing desserts that are true works of art! 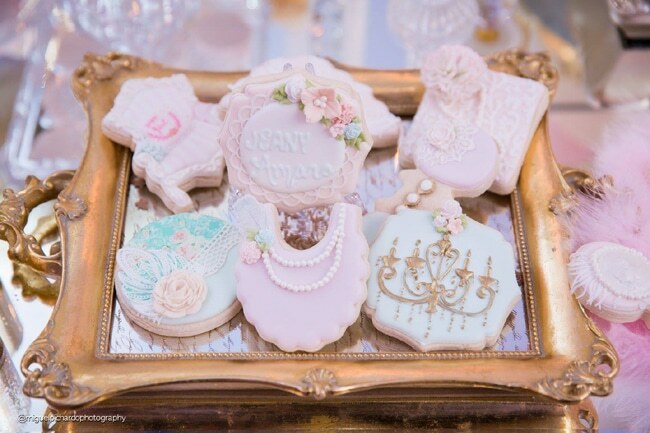 Is the mom-to-be a BIG lover of pink and all things French? 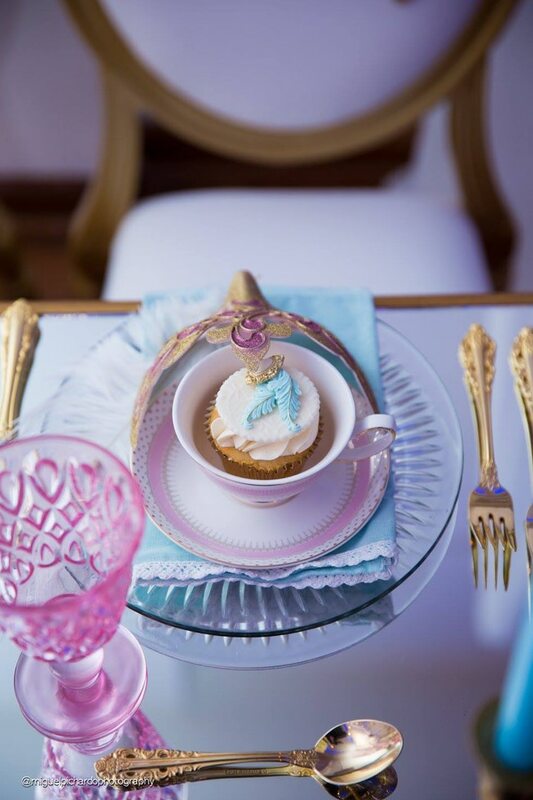 Pick up some inspiration for planning an amazing beautiful Marie Antoinette baby shower for her! 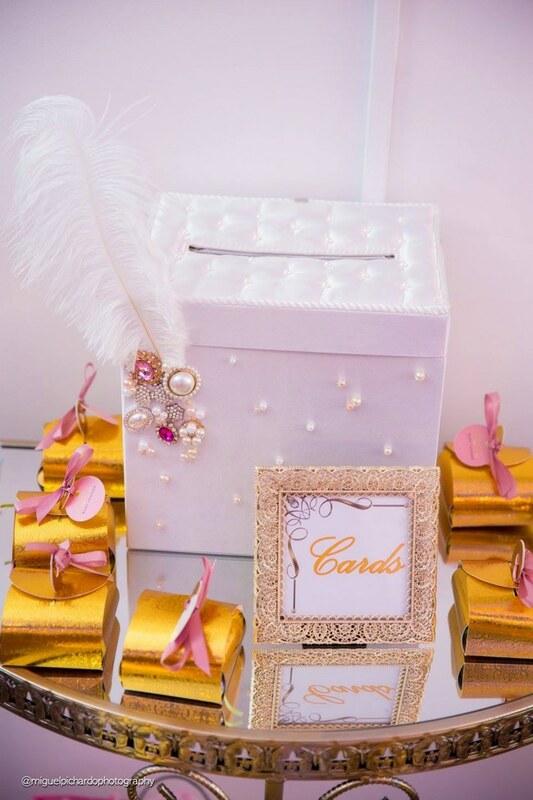 It’s elegant and classy and ticks all the boxes, and is put together by ADAL Kreation! 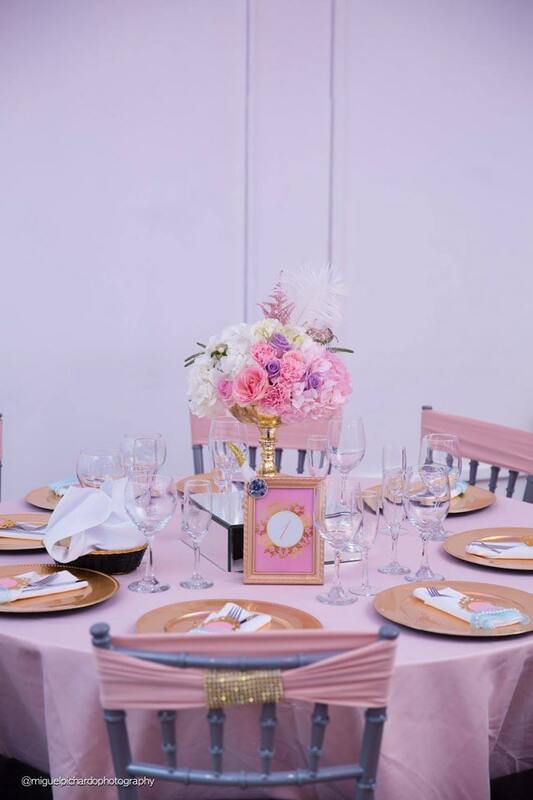 One of the best highlights about the entire decor for this gorgeous Marie Antoinette themed baby shower was the beautiful interplay of colors – blues, pinks and purples in pastel tones. 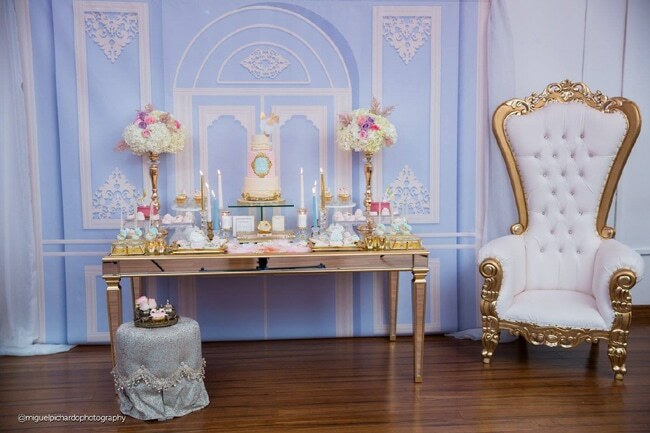 The gold details on the cake, the flowers, boxes, frames and even the sugar cookies brighten up the entire setup and give it that WOW factor! 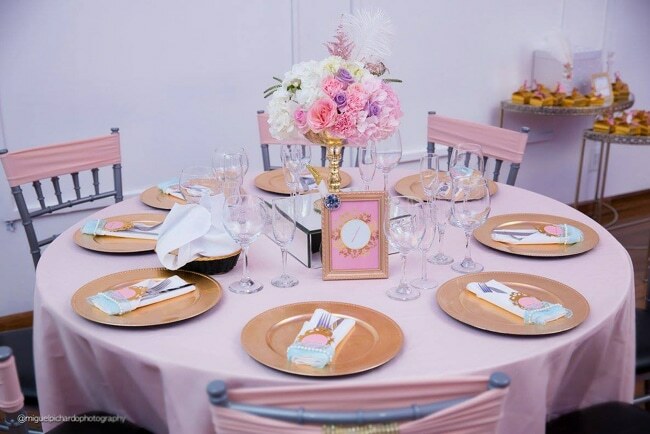 And the mom-to-be obviously deserves her rightful throne – the tufted seat in plush white and the gold details on the corner make it the perfect addition to this wonderful baby shower theme! 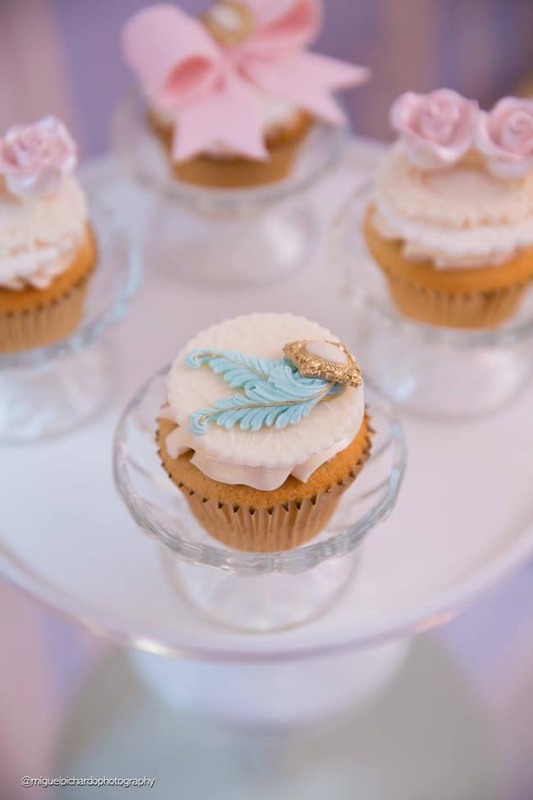 We absolutely adore the pretty little feathers topped on the cake! 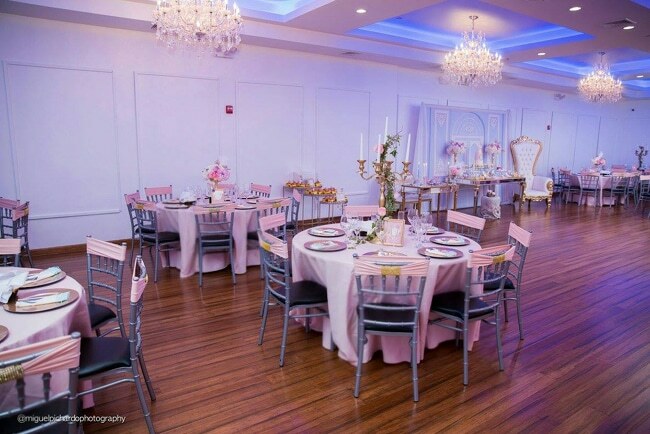 They complimented the entire decor so perfectly, and demonstrated how everything was done with utmost precision and highlighted the attention to detail. 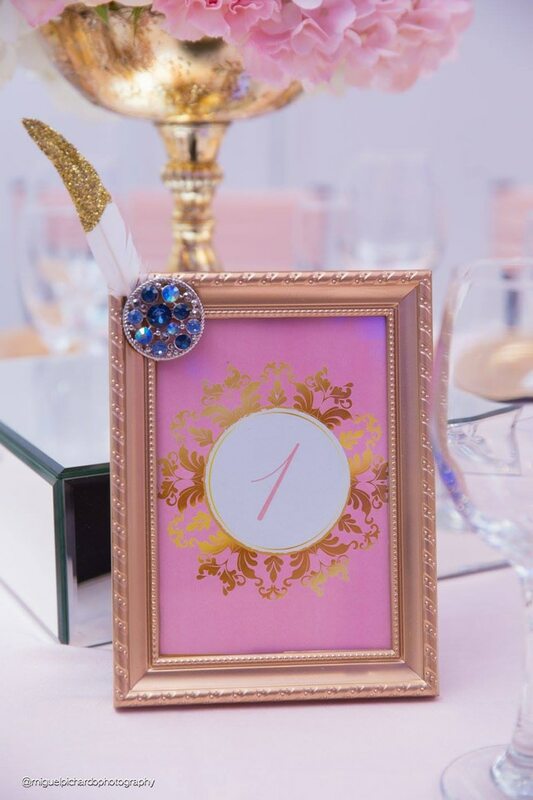 We also love how the middle tier of the cake had these little dotted details. 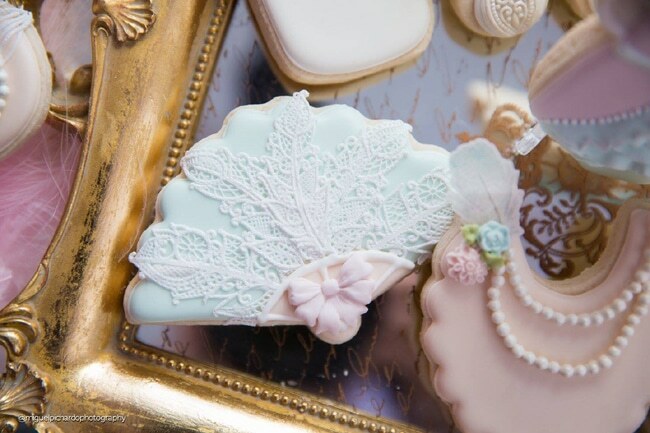 It adds a nice contrast of textures between the two somewhat plain yet elegant layers of the cake. 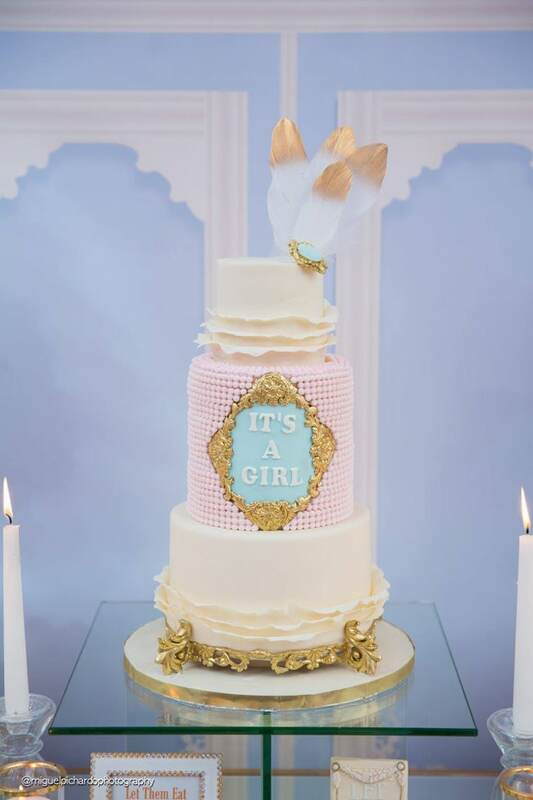 The gold detailing in the middle and on the top and the bottom literally take things up a notch and add to the elegance of the cake, making it look no less than a piece of art. 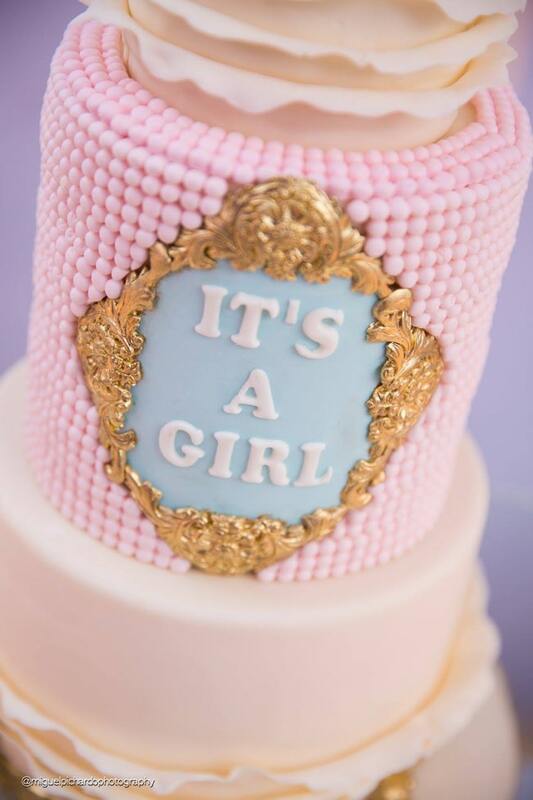 We also love how the middle tier of the cake had these little dotted details. It adds a nice textural element in the middle of two smooth tiers. And let’s take a moment to appreciate the beauty of those delicate ruffles on the first and third tiers of the cake! 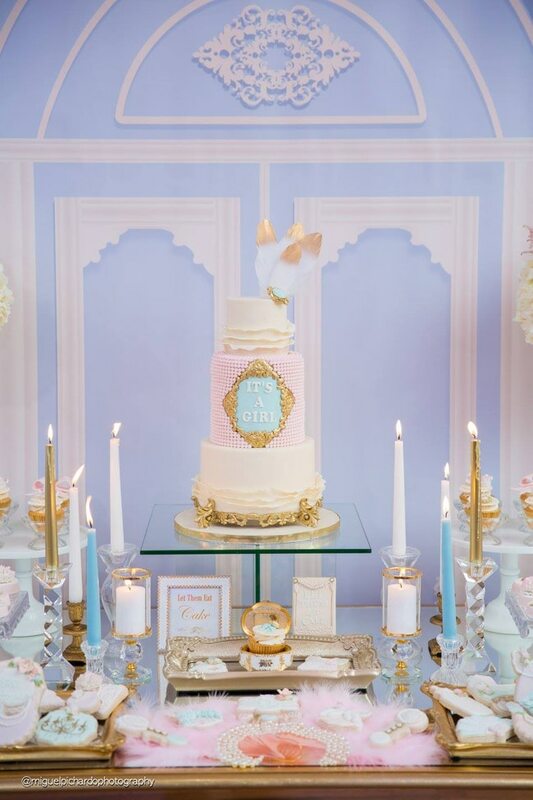 When it all comes together, it makes for the perfect Marie Antoinette cake! The sugar cookies were no less. 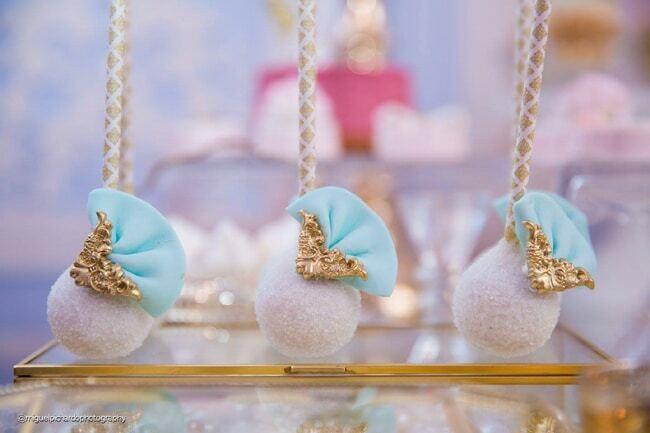 In fact, each one of them were crafted with so much precision and love by Mayra’s Cakepops, that we’re left spellbound! 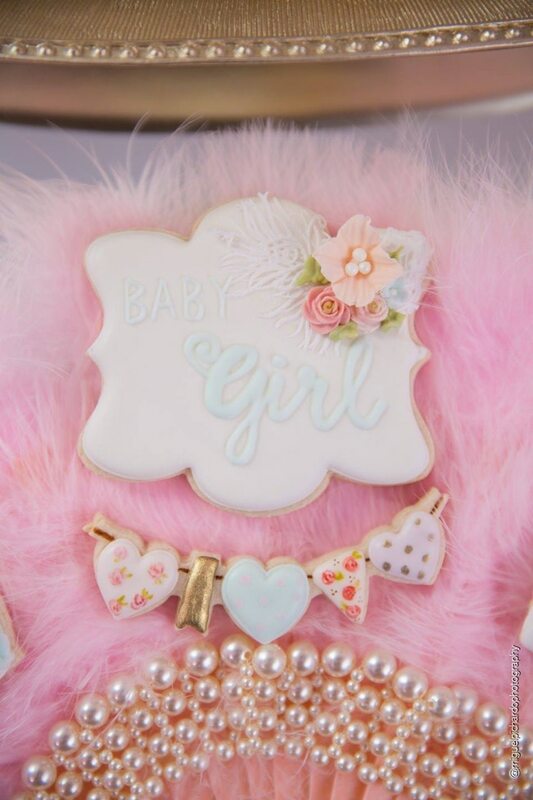 Hand-painted sugar cookies set on a blanket of fur call for tons of Instagram-worthy pictures! Because why not? 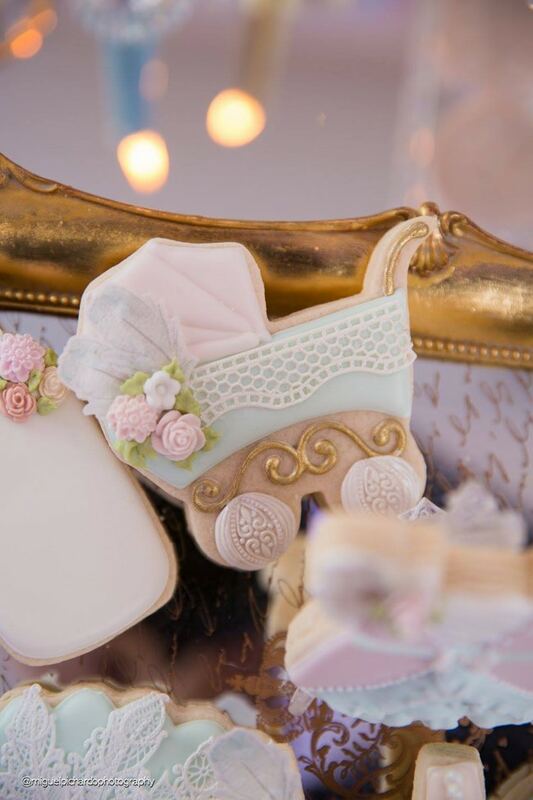 Look at the intricate details of this little carriage cookie! Those little flowers, those wheels and that mesh lace detail! It’s truly a work of art that the picture doesn’t do justice to! 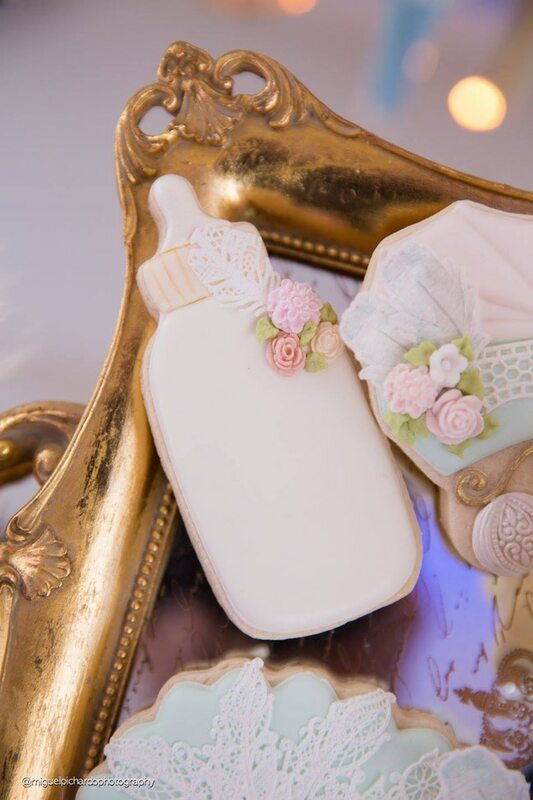 And obviously, the milk bottle-shaped cookie had to be Marie Antoinette-esque too! And look at them sitting perfectly on the tray! 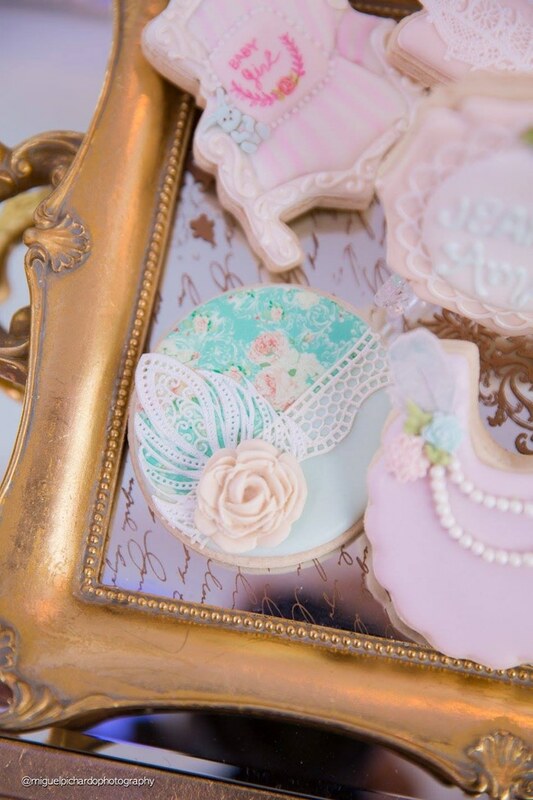 Blues, peaches and pinks come together so wonderfully on these little cookies! 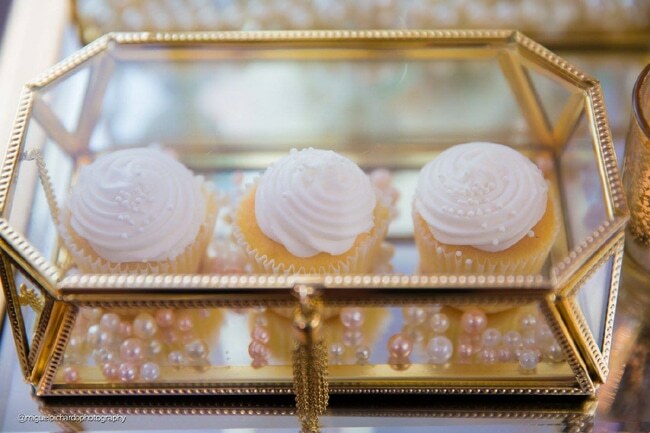 And those little sugar pearls that line some of these sweet treats are beyond comparison – isn’t it? 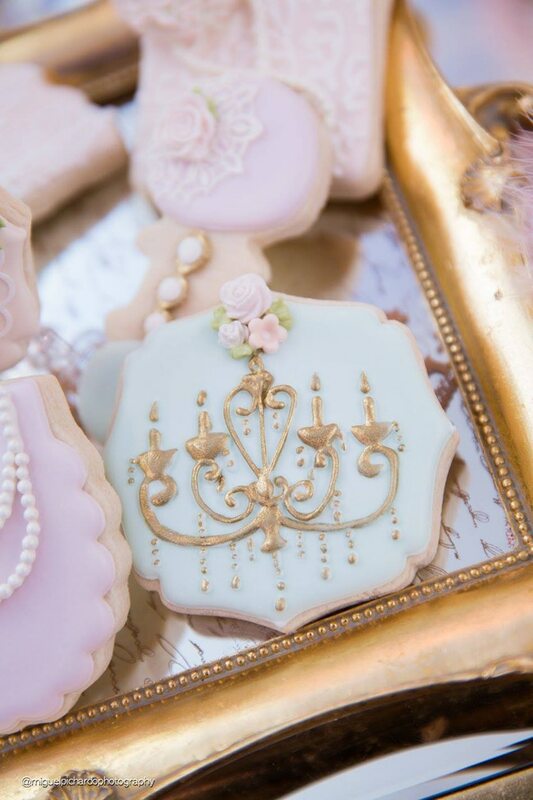 And obviously, when there’s a Marie Antoinette theme baby shower, there can never be enough gold details. 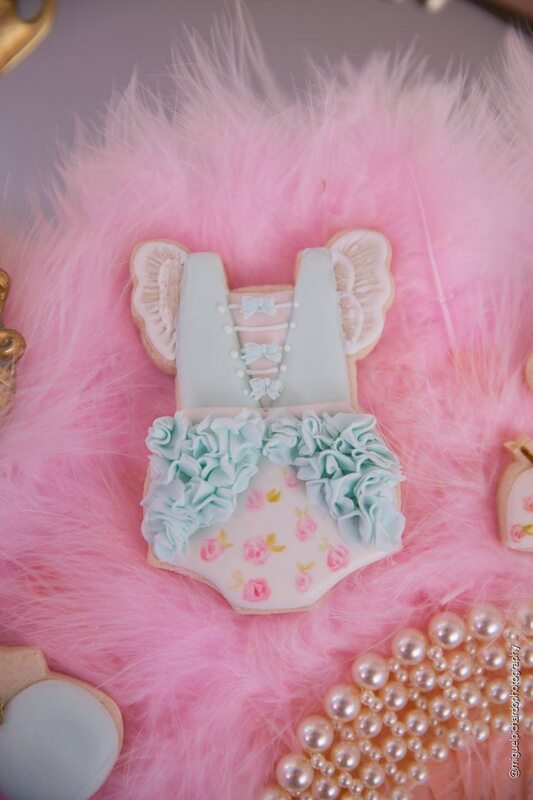 And just when you thought the mesh detail on the stroller cookie was delicate, Mayra’s Cakepops amazes you with more – an even more delicately designed cookie! 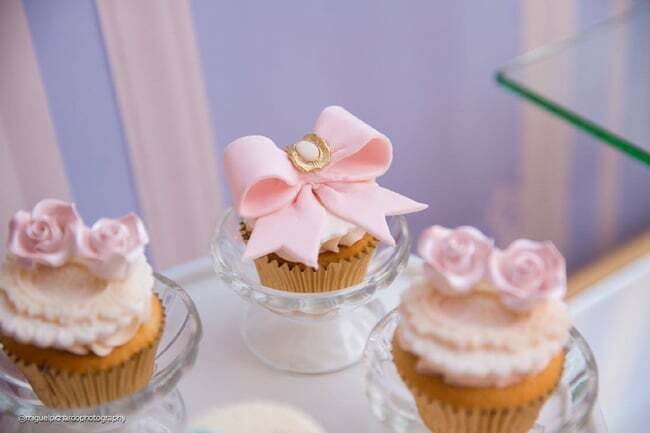 And when the cookies got their share of importance, the cupcakes also deserved the attention for being so effortlessly beautiful! 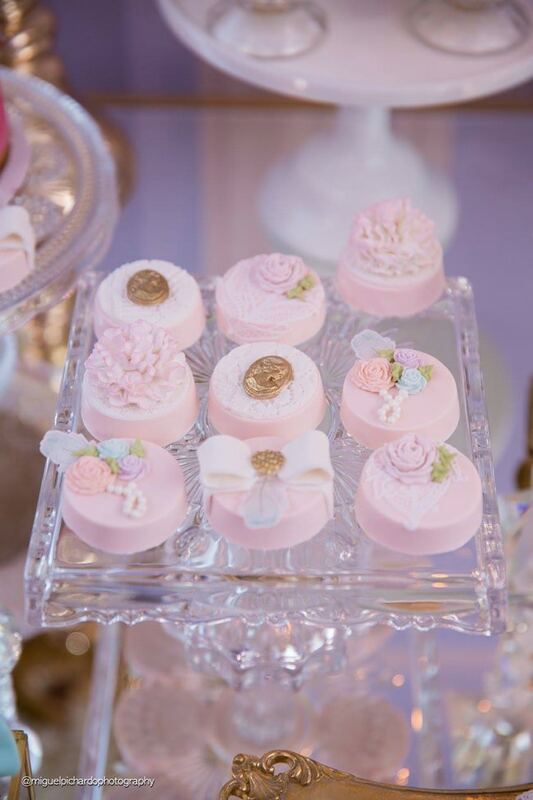 Truly, the cupcakes designed by La Cuchara Dulcetta are nothing less than a treat for the eyes – again, with a gorgeous interplay of pinks and gold in bows and roses! Every cake pop you lay your eyes on is an absolute visual treat! 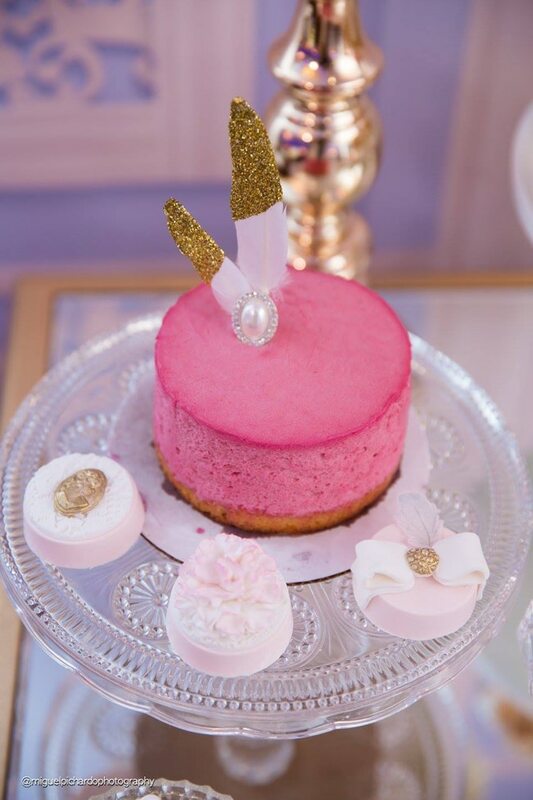 From pops of bright pink color to elegant gold details on a white sugar-crafted bow – it’s all there! 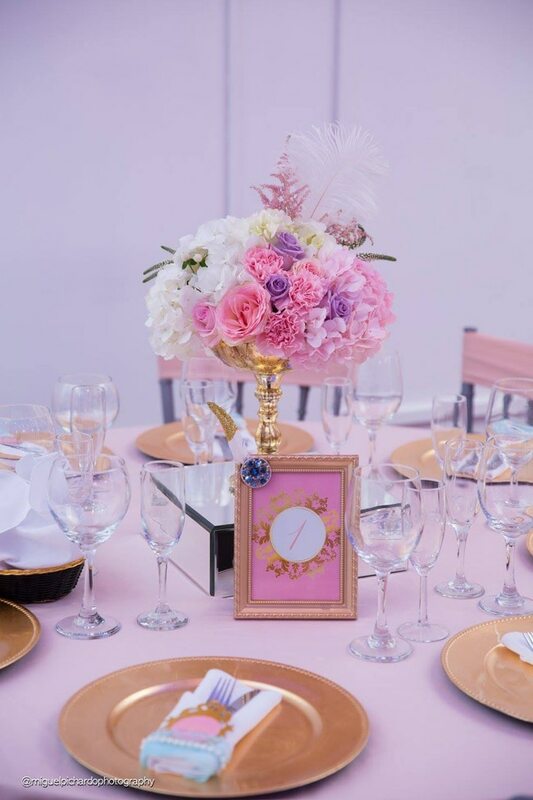 And a BIG kudos to Glam Party Rentals for glamming up the place in Marie Antoinette style with their careful selection of decor that complimented the entire setup! 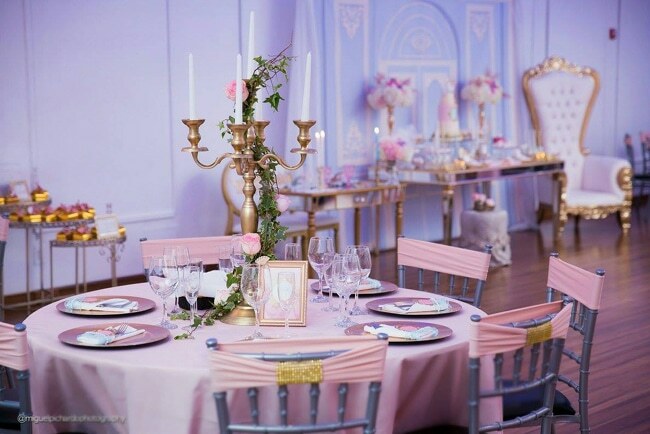 Everything from the throne chair and the mirror table to the tables and chairs – all of it was impeccably done in true Marie Antoinette style. 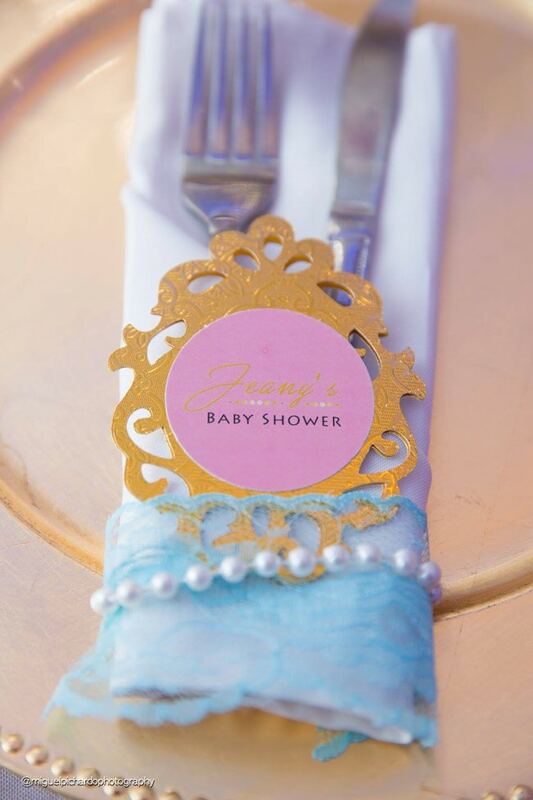 We love how much thought and effort they put into making sure everything was perfect – even the way they had all the three key colors of the baby shower reflected in their cutlery holders! 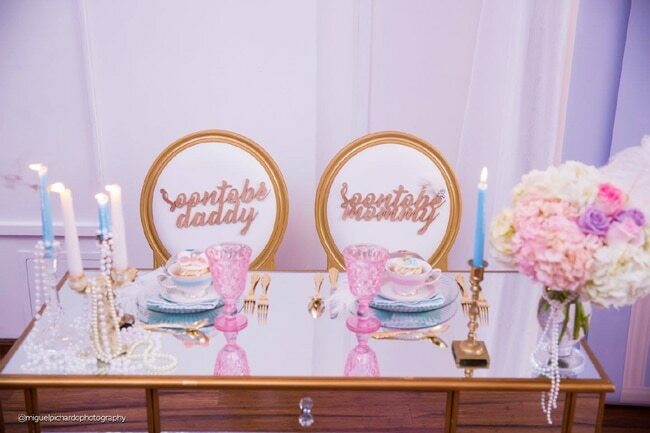 And the mirror table set up specifically for the mommy- and daddy-to-be was just beyond gorgeous! 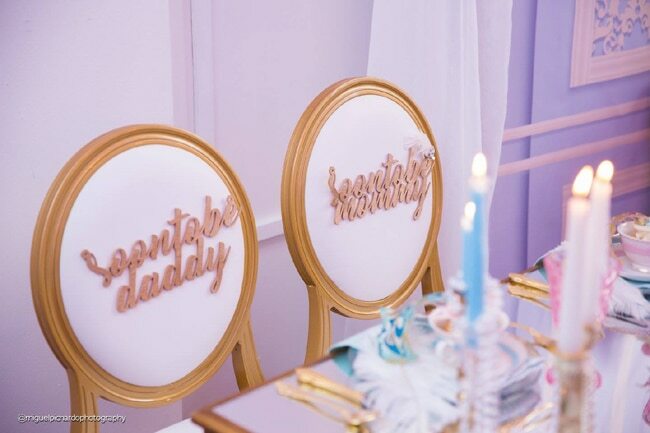 The lettering on the chairs obviously deserved a special mention for being so lovely! 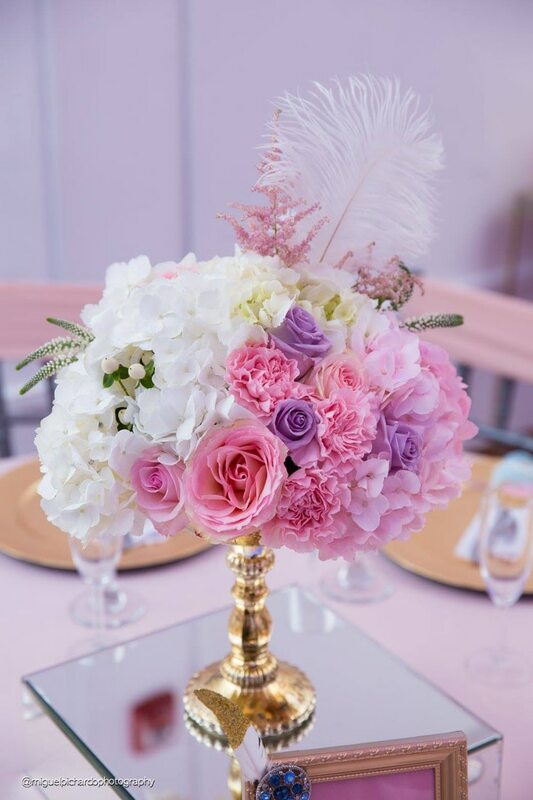 We just can’t seem to stop obsessing over these flowers! 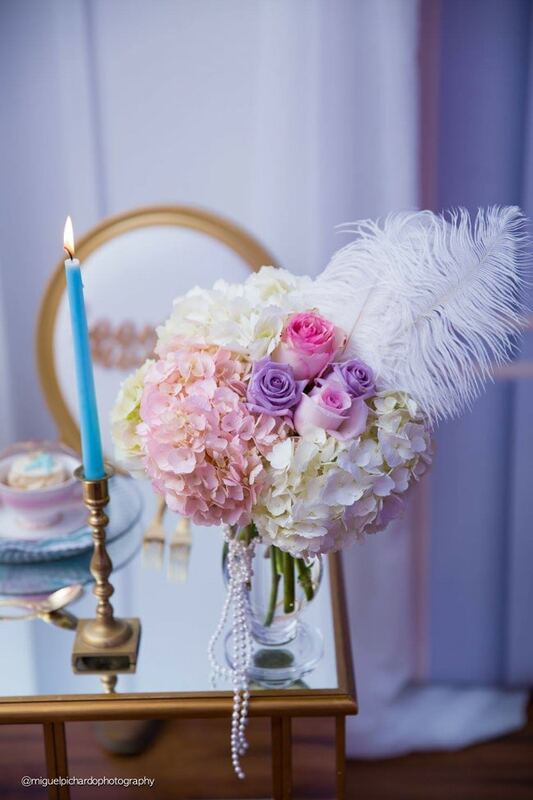 Who thought pinks, purples and whites would come together so beautifully! 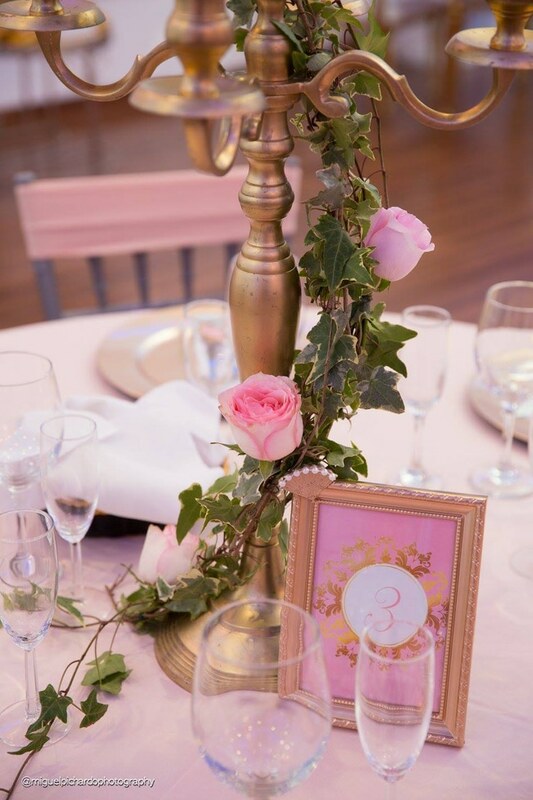 The candlestick just got taken up a notch with this twirl of roses! And here’s another close-up shot of the flowers! Because yes, we’re still not over them! Cheers to Huntpoint Flowers Market for doing such a wonderful job on them! 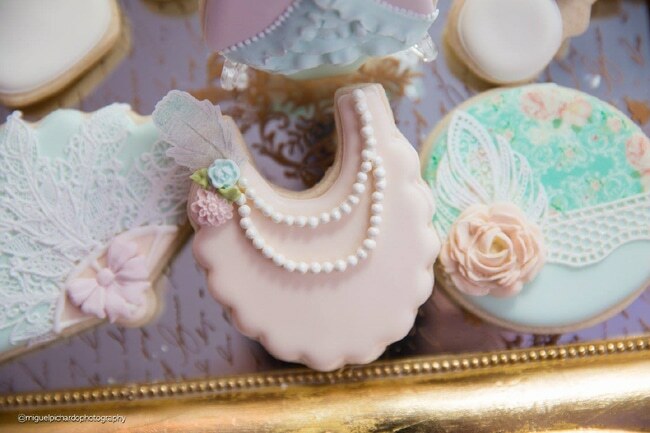 Because we can never have enough pearls now – can we? And it all came together beautifully on this extraordinary backdrop with the wood detailing done by The Wood Shape Store! It was so pretty it truly deserved a special shot! 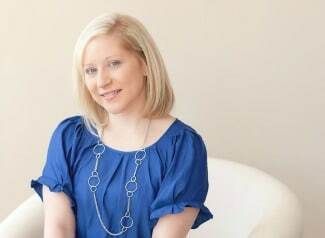 A big hand to Miguel Pichardo Photography for capturing it all! 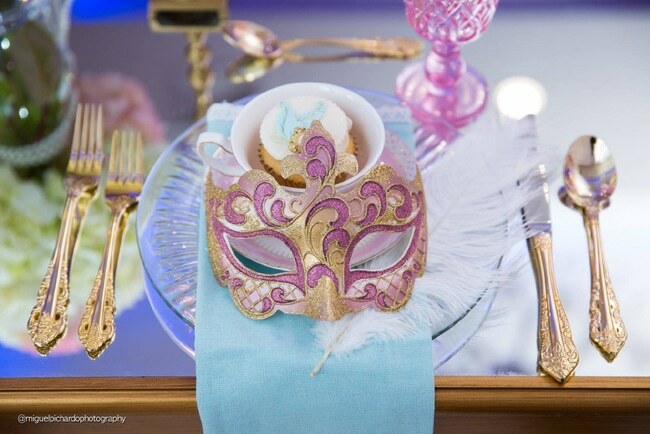 And you can obviously never go wrong with a masquerade mask! Perfect for the time when you want to pose and click tons of pictures and have a lot of fun with friends and family! The card box too, deserved a special picture and a special mention, because well, it’s clearly too gorgeous for words! 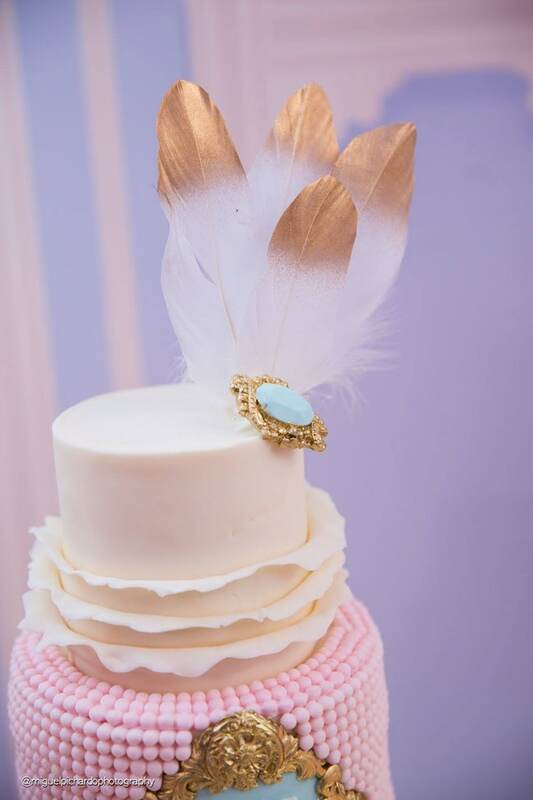 The fluffy feather, the pearl details and everything else! 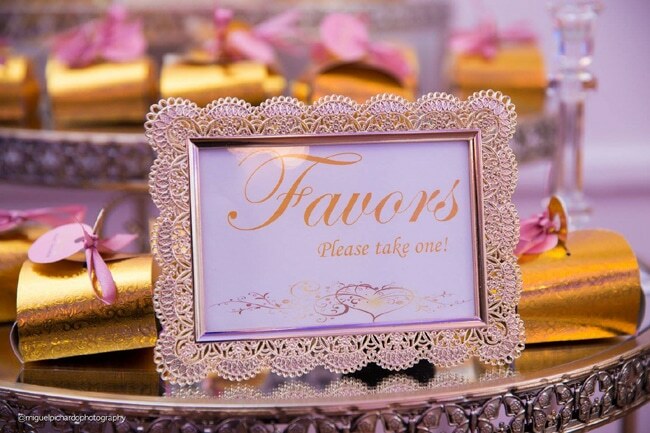 And the favors were all gold, wrapped up neatly in a little pink bow, putting the perfect end to a gorgeous Marie Antoinette baby shower! 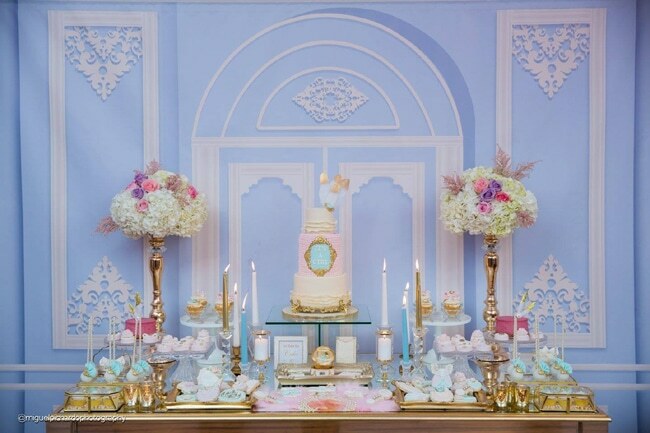 All in all, this Marie Antoinette baby shower was a work of art! 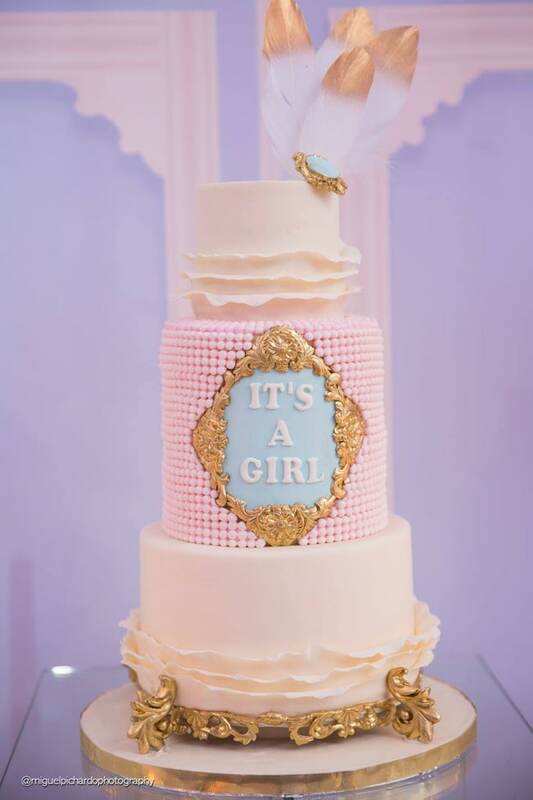 It had that touch of elegance to it while still being a brilliant choice for a baby shower with all the right colors for a baby girl – pinks, whites and purples in pastel tones! 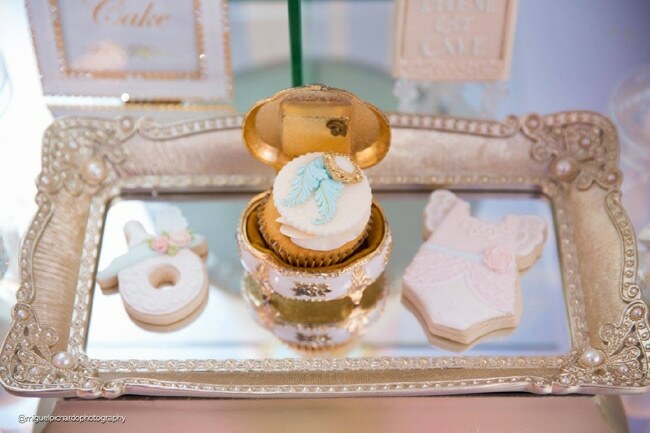 What’s your favorite detail in this Gorgeous Marie Antoinette Baby Shower? Let us know in the comments below!